The 1080P HD Projector delivers high-definition images along with 1200 lumens of white and color brightness. 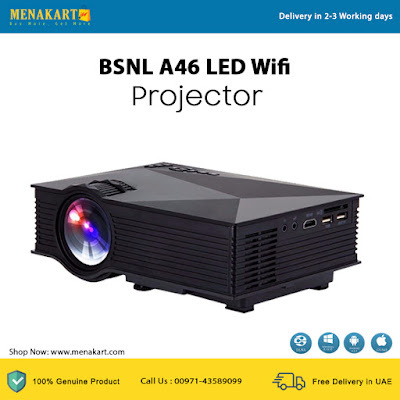 This portable projector features up to 1080P resolution and has a 800 : 1 contrast ratio. Furthermore, the Home Cinema can project images up to 130" and supports wifi connectivity. The is the perfect projector for a range of users because of its sleek compact size and simple setup. Connect your smartphone device or USB to start experiencing the 1080P resolution videos. The 1200 lumens LED lamp will project clear and bright images even when you don't have complete control over lighting conditions. Supports up to 1080P resolution. 1200 lumens brightness with 800 : 1 contrast ratio. Wi-Fi connection, enjoy big screen visual feast. ACC graphic engine, ensure vivid and detailed image. Rich interface, USB, SD, HDMI, 3.5mm earphone, etc. Build-in power supply, while you are watching movies. You can charge your phones meanwhile.